So this is happening Saturday,Woohoo!! In today’s world, neon-wearing, color-blocking Greek kids cruise down the highway blaring dubstep versions of Rihanna and LMFAO songs. Synthesizers bounce beneath layers upon layers of programmed loops. And, if you listen closely, even the silence seems to be begging you to call it, maybe. They went to Tahiti, because Tahiti has no West Nile Virus. Fear not, though; the aerial has been sprayed, and the days have returned. 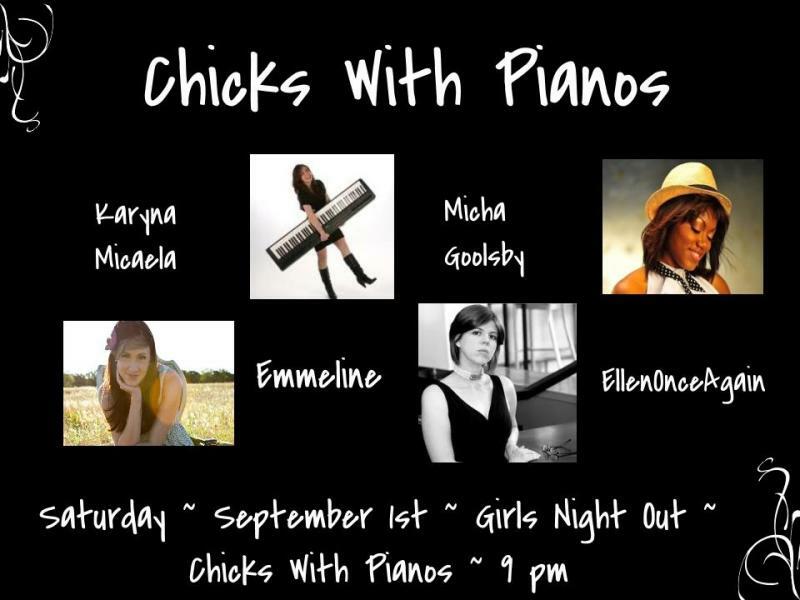 They’ve returned so hard that we’re bringing you not one, but FOUR chicks with pianos. Karyna Micaela, Ellen Once Again, Micha Goolsby, and Emmeline, to be exact. Yup. You read that right. Four pretty girls. Four pianos. One night. Believe me when I say that the delicious coffee at Opening Bell is not the only reason you don’t want to miss this show. Mark your calendars. 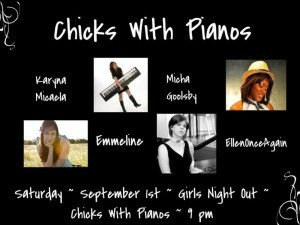 September 1st is Chicks with Pianos Day.